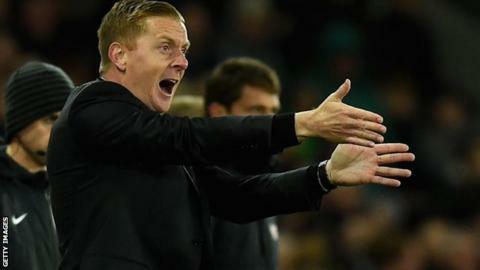 Former England and Leeds defender Danny Mills says Swansea City should hold their nerve over Garry Monk's future. Manager Monk's position is being considered by the club's board after one Premier League win in nine games. Mills, who made over 200 appearances in the top flight thinks it would be "very harsh" to dismiss Monk at this stage. "Of course it's a results business, but this is a club that has a long term plan and has stuck with managers," he to Radio Wales Sport. "Who would come in to replace him? Who could do a better job? "Realistically in terms of the budget where are Swansea's expectations? Top half of the table? "I think that would be considered a success." Following his permanent appointment in May 2014, Monk guided Swansea to their highest Premier League finish of eighth in 2014-15. Despite a slump that has seen Swansea win only three times in 13 League games, Mills says the Swans board should not get "edgy". "Realistically I think Garry Monk will end up finishing anywhere between eighth and 14th," he added. "That's relative success. That middle section of the Premier League this season is so very, very tight. "I think to pull the trigger now with no realistic replacement to come in would be a little bit naive." "Realistically does anybody really see that Swansea are going to go down this season? I don't. "They will be in the Premier League next season." After Swansea beat Aston Villa 2-1, the midlands club sacked Tim Sherwood. But ex-Swansea boss Brendan Rodgers was the highest-profile Premier League management casualty this season, having being dismissed by Liverpool in October. "As results start to go against you [at] this time of year you've already had one or two managerial casualties," said Mills. "I just think owners, board members start to get a little bit edgy and they start thinking 'well they made a decision, they fired somebody and it's possibly working out'. "It's not always the best thing to do."